oatmeal cherry pecan cookies — Mel bakes things. You guys. I think I have a mild obsession with oats/oatmeal. I can't stop baking with them. I think this might be the fourth oatmeal-based cookie I've posted on this blog. In less than a year. A couple of weekends ago, the weather was really nice and Brandon and I decided to take a long walk to one of my favorite bakery/cafes in the city, Floriole. We had lunch, and then at the last minute decided to split one of their giant oatmeal cookies. It was MAGIC, I tell you. Magic. A good balance of sweet and salty, rounded out with the flavors from the tart dried cherries and toasted pecans. It needed to be recreated. And so I did. 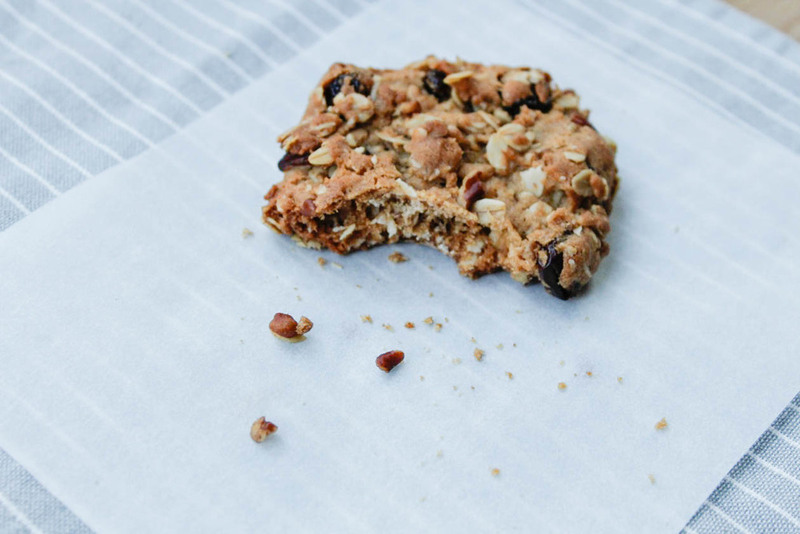 They're pretty much like a really awesome granola in cookie form. They're also obscenely easy to throw together, and you could swap out cherries for other dried fruit, and change up the nut variety, too. Brown your butter. Set aside to cool a bit. In a medium sized bowl, stir together flour, baking powder, baking soda, and salt. In the bowl of your mixer, combine browned butter and sugars. Mix on medium speed for 5 minutes or so. Scrape down the sides of the bowl. Add the egg and vanilla. Mix again for 30 more seconds. Add the flour mixture, and mix on low speed until just combined. Scrape down the sides of the bowl again, and mix for a few more seconds. Stir in your pecan chips and cherries, and then your oats. Refrigerate mixture for about 30 minutes. While you're waiting, preheat your oven to 350F. Portion your dough, and place on cookie sheets a few inches apart to accommodate any cookie spreading. I used about 2 TB of dough per cookie. You could do more, or less, but it will impact your baking time! Bake until golden. Mine took about 15-20 minutes per batch, but again, this may differ depending on the size of your cookies, and how rude/friendly your oven is. I happen to have a very rude oven. Store in an airtight container. These cookies do last quite a while when stored airtight, but they will get less chewy and more crisp the longer they sit.